Get inspired to eat healthy foods with this eBook which is jam-packed full of easy to make breakfasts, snacks, lunches, dinners and smoothies. Watch this quick video here about the book. Excellent healthy eating book, with plenty of choice for different tastes, and lots of recipes that don’t take too long to prepare or cook. Easy to fit into your life, too. Very enjoyable, thank you, Lucy. Excellent book and I love how it is not just recipes and also has information about minerals, herbs and adding healthy colour to our plates. The links to the workouts are absolutely fab as it even saves the time of going through videos to decide which one to do!! 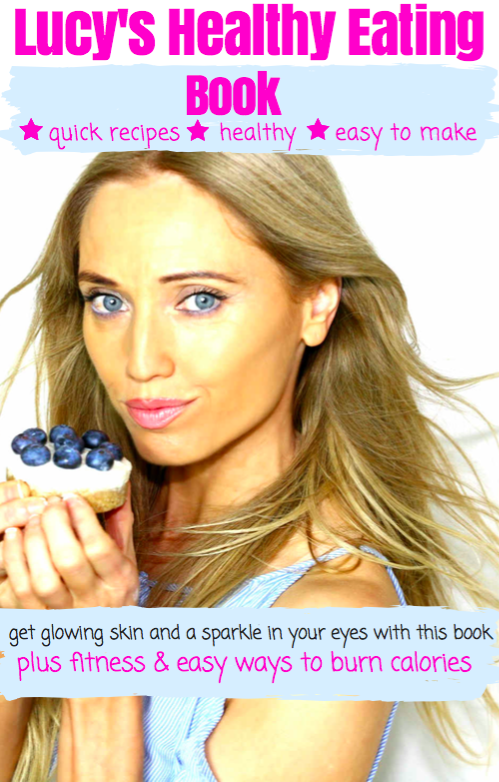 I give this book review ⭐⭐⭐⭐⭐ because it gives super simple delicious healthy recipes and exercises and an overall simple approach to healthy eating, without following a specific diet or eliminating a specific food group. I love this eBook! It has some amazing recipes that are so truly very simple. And I love that I got an awesome fitness feature as well in the eBook! Thanks, Lucy! Thank you Lucy for making a cookbook!! Love it. The recipes are simply and so yummy. I feel really good inside when I eat them, and it doesn’t take long to make any of the recipes. I also love all the information on nutrition and that you can click on areas to tone and it goes to a You Tube video! So handy and easy. I highly recommend this eBook!! I love this book. Healthy eating made easy (as in really easy so there’s no excuse not to eat healthy) and yummy too of course!!! I highly recommend it. I have recently found Lucy and I am so glad I have. She has so far inspired me to start making smoothies again and start workouts again. Feeling good and longing to look good. Will try to keep it up this time. I am really enjoying the recipes in the book. They are easy to make. Thanks Lucy for the book. I just purchased this book and I’m already in love with the content. Finally a book that truly have “simple” recipes. And the portion of your book where you can tap on a body part and it takes you to a workout for that part of your body is ingenious…. Well done and thank you!!! Nice workout this my first day …. Wonderful book! I love the combination of foods and spices. Also, very easy to make and it gets you started on exploring new healthy options. I am grateful to Lucy for creating this book and all those exercises that you can access via the book. Very clever and saves time. I feel better now than I have in years and I’ve only been at this for a week. Thanks, Lucy! Your exercise videos, healthy eating book and positive thoughts is what I’ve been needing. This book and Lucy’s videos have changed my life. I started doing her workouts two years ago, saw results and then fell back to where I started or even worse. The problem was that my eating habits were far from healthy. I started preparing some of the snacks from videos that Lucy shared on her channel. I bought products that I have never had in my pantry before and it was totally worth it. Almost everything tastes amazing. After falling back again to my unhealthy eating habits I decided that this cannot continue anymore. So I bought this book, changed my eating/ shopping and meal-prepping habits. I now make a meal plan for every week and I won’t lie, it is more work than just eating toast with some chocolate cream. But it tastes to much better, it is healthier and you can feel your body thanking you for the vitamins and nutrients that you’re providing. After a couple of days I already felt the positive effect. At some point I wanted to give myself a treat, you know, that toast with chocolate cream and you know what? I hated it! I could literally taste the unhealthiness of it, the horrible amount of sugar. My treat now are the peanut butter balls or a few pieces of dark chocolate and some almonds. When I come home from work, my body is craving vitamins instead of sugar. I won’t lie, there are still too many days when I eat rather bad food, but I don’t beat myself up about it. It’s a journey. I will try more recipes from this book and I always, always, always have to go back to the overview of vitamins and minerals, because my memory is so horrible. But that’s the beauty of the book: You can educate yourself in the easiest way. And if you are at a point where I once was: Just go for it. Go to different food stores to pick up ingredients that you never used before. You might find out that you don’t like certain things, and you might find a neighbor who likes it or you have to throw it out… On one hand it’s a little waste, on the other hand it’s an investment in your own well-being. You will discover so many new flavors that you will love and at some point you will enjoy some easy, healthy meals and you will never want to go back to your unhealthy days. By the way, I really recommend combining these recipes with Lucy’s workouts. The workouts will make you want to eat less and healthier and the clean nutrition/ diet will help your body and your mind to be up for the workouts. And if I have a really, really bad and naughty cheat day, then I am always so happy to get back to the healthy food the following day. I cannot praise Lucy’s work enough. Although I also search other websites for easy and healthy recipes, this book is definitely my favorite and it has been a very good kick-off to get into the right mindset. Thank you, Lucy! How much in Australian, and are the ingredients standard that they’ll be available in Australia ..
hey lucy just tried one of your workouts for 7 mins. and i loved that i felt good doing it. at 53 yrs with a very lethargic lifestyle my body is like someone elses. i am determined to make this 7 days and then get back my body, my health and my life. Discovered Lucy on you tube and havnt looked back ! I feel totally amazing since following the 7 minute workouts and have just purchased this book ! Can not wait to read it and start implementing the recipes and new way of eating into mine and my family’s life. I live your videos, I have just started your walking at home, health and fitness video for beginners. It’s two weeks now and I am beginning to feel great. Am also trying to use some of your recipes. Thanks for the videos, I hate going to the gym. This book is amazing. The recipes are super easy and they don’t take a lot of time to make. I love how it breaks everything down so the reader is educated on what she getting from the food.